Civil War Sites Near Washington, D.C. In 2011 David Goodrich celebrated his recent retirement by bicycling from Delaware to Oregon. He wasn’t a newcomer to bicycle travel. Goodrich had taken a challenging solo tour through Washington, Idaho, and Montana a few years earlier. He would take several more throughout the country before this book was published. A Hole in the Wind is structured around that 2011 trip, but Goodrich also recounts those other tours because they provide before-and-after context for what he encountered on his cross-country journey. 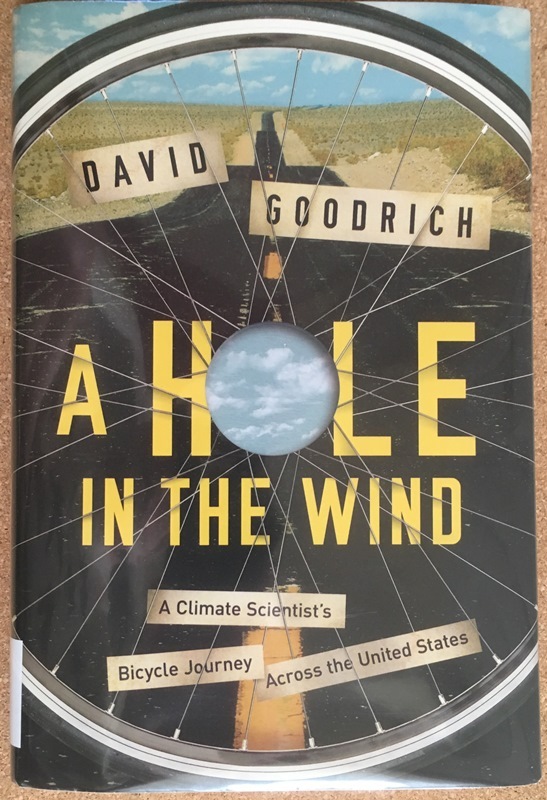 For as a scientist who had devoted his life to studying Earth’s climate, Goodrich was on something of a mission: to see and experience firsthand the effects of climate change—and attitudes toward it—across the country from the seat of a bicycle. Goodrich writes authoritatively about climate change. He worked at the National Oceanic and Atmospheric Administration (NOAA) and served as director of the United Nations Global Climate Observing System in Geneva, Switzerland. He retired as head of NOAA’s Climate Observations and Monitoring Program. We often think about global warming largely in terms of sea level rise, whose effects Goodrich encounters in Delaware at the start of his journey. But its effects are far more pervasive and sometimes unexpected: droughts and aquifer depletion on the plains, pine beetle infestations killing off vast tracts of trees out West, vanishing glaciers, increasing numbers and sizes of wildfires, species forced from shrinking habitats, and shifting of meltwater timetables that affect animals and agriculture alike. Goodrich encounters dramatic evidence of all this and more. Despite the mounting effects of global warming and dire forecasts of things to come, Goodrich remains an optimist. He is convinced that the world’s nations are fully capable of dealing with the human-caused effects of global warming and of stopping or even reversing that climatic trend. He cites as an example the success at reducing the ozone hole discovered in Earth’s atmosphere. Caused by accumulations of human-produced chlorofluorocarbons, the hole was an ominous warning sign and a growing threat to human health. But thanks to government and industry action, it is shrinking. A Hole in the Wind is not an elegy for the world as we have known it, but a call for action and a declaration of hope. For more about me, check out my blog "Bike Walk Drive" at https://bikewalkdrive.wordpress.com/. This entry was posted in Musings and More and tagged Books. Bookmark the permalink.